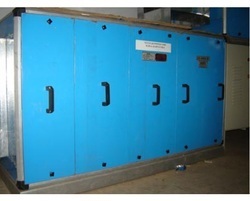 We are a leading Manufacturer of air handling equipments and air handling equipment from Mumbai, India. 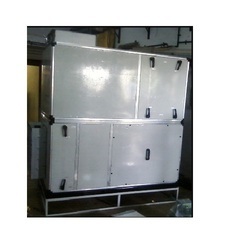 We are leading manufacturer and exporter of Air Handling Equipments and our product is made up of good quality. The air handling unit provided by us is designed by our professionals using high quality material & modern techniques. AHU, Air Handling Equipment, FCU, Fan Coil Unit are available at Standard or Custom design. Each and every AHU is fully tested at our factory before dismantling to avoid site problems. Customs Pharma AHUs are also available with documentation DQ-IQ-PQ-OQ. Kruger/Nicotra blowers are used in coupling (direct/Belt) with Hindustan/ Crompton/ Havells/ Siemens motor. Variants available are Floor mounted, Ceiling suspended, Single through, Closed loop, 25/43 mm PUF, thermal break, Two tire (for limited space) etc. We are leading manufacturer and exporter of Air Handling Equipment and our product is made up of good quality. These are basically used to distribute dehumidified dry air. We offer air handling equipment which are duly tested against set standards. Looking for Air Handling Equipment ?